Since when has performing a search on Google been classed as suspicious activity? This is not surprising as both Google and TomTom take their map data from Tele-Atlas, who would appear to be the ones jumping the gun here. Ironically, TomTom’s map update service proudly claims “Tomorrow’s maps today“. I didn’t realise they meant literally. A representative from The Highways Agency has today confirmed that they were unaware of Google and TomTom showing the bypass as open. 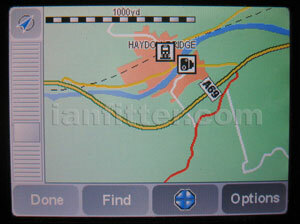 They also noted that Google maps has given the old road the number B6319 (as have TomTom) which has yet to be confirmed. I drove along the A69 today and the bypass is now open. Obviously never tried the buses round here. On my way to work this morning, I spotted the Google Street View camera car parked up on the A666 Bolton Road in Kearsley. Unfortunately I couldn’t pull over to take a pic, but this is what it looks like. Nice to see that Experian haven’t wasted any time in exploiting the current scare due to HMRC’s Child Benefit Data SNAFU. Entering ’25 million’ (or even just ‘million’ into Google, gets you an advert for Experian’s credit checking service, offering to ‘check that your Child Benefit data isn’t being used for fraudulent purposes’. Google Analytics have come up with a flash new interface, but have made one glaring error – They have lumped the ex-Soviet Union into Europe, not Asia. Click on the thumbnail below to see. Liverpool Vision have recently complained to Google about their woefully out-of-date images of Liverpool on Google Earth, while new landmarks in London, such as Wembley Stadium have up-to-date images. I’ve got to say, they have a very good point. Manchester does not fair much better. No.1 Deansgate, Harvey Nichols and Urbis are all shown as building sites, even though they were completed in 2003, 2003 and 2002 respectively. Similarly, the large Tesco Extra store next to the Reebok stadium (which I know was open by November 2001) is still shown as the previous Fort Sterling (now Georgia Pacific) site. Google say they are dependent on their digital image suppliers, but that is a poor excuse. Why order out-of-date images? Using images that are out of date by up to 5 years is extremely poor. I suppose that we should count ourselves lucky that they show at a decent resolution at all. There are several built up areas of the UK (Warrington and Ponteland are just two examples) which are just a useless blurred image. Come on Google, get your act together and get some decent up-to-date images. It’s spoiling an otherwise excellent program. It appears that Manchester’s imagery has been updated, although it does tend to have a washed out appearance, as can be seen from the following screenshot. The new imagery roughly aligns to the M60. Google’s bot has been hammering my site throughout March (over 16,000 hits, more than 70% of traffic). So what do I have to show for all this bandwidth usage? Three measly supplemental links, all well out of date, one of which has been banned in my robots.txt file for more than two years! What the hell is Google up to?